This morning I dug into March 2015 for today’s #tbt to see what we were blogging about three years ago. I had almost forgotten about the “feeling fat” emoji and how some great activism got Facebook to remove it swiftly after introducing it. We still use “fat” as a stand-in for all manner of horrors, and “feeling fat” taps into that on so many levels. It’s a problem, not just when it is used to turn back on ourselves but the very fact that its social meaning runs so deep that people can use it that way at all. Something to think about (some more). 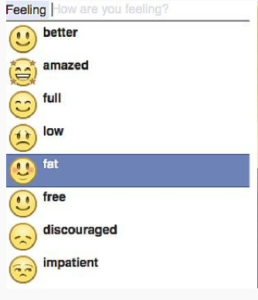 You’ve probably read by now that Facebook has removed its “feeling fat” status update/emoticon from the list of options. Over 16,000 put pressure on the social media goliath by signing activist group Endangered Bodies’ petition. When Facebook users set their status to “feeling fat,” they are making fun of people who consider themselves to be overweight, which can include many people with eating disorders. That is not ok. Join me in asking Facebook to remove the “fat” emoji from their status options. “We’ve heard from our community that listing ‘feeling fat’ as an option for status updates could reinforce negative body image, particularly for people struggling with eating disorders,” Facebook (FB, Tech30) said in a statement. Wow. I forgot that this emoji even existed. That’s probably a good thing I don’t remember.